ONE: Melt the beeswax in the microwave for two minutes total, stirring after each minute (this is what happens if you leave in in the microwave too long- read the blog post here). When the beeswax is slightly melted add the Sweet Almond Oil. Give it a little mix and pop it back in the microwave for another 3 minutes total, stirring after each minute until the mixture is a liquid. TWO: Then stir in the Shea Butter, Cocoa Butter, Fragrance Oil (Summer Fling) and Green Tea Extract. Mix for 2-3 minutes until all of the butters have melted from the heat of the oil (this helps to prevent the shea butter and cocoa butter from going grainy). If you need to pop it back in the microwave to melt all of the butters go for it, 30 seconds will do the trick. Tip: Skin loving extracts will add a luxurious touch to any lotion bar recipe. 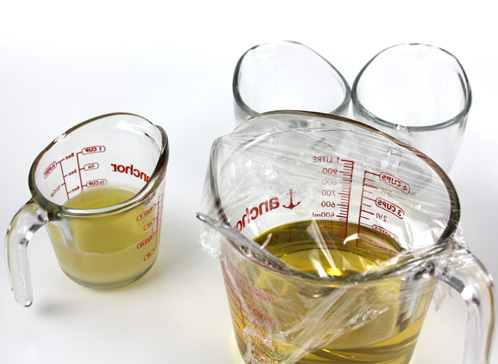 Just make sure that you’re using an oil soluble extract. Water soluble extracts will not mix in. THREE: The goal is to evenly divide the batch into 3 separate containers so we can add our colorants. Pour 1/3 of the mixture into a small heat safe mug or container and cover the larger container with plastic wrap to keep the rest warm. Then mix in 1 mini scoop of Lip Safe Yellow Mica. Mix well. 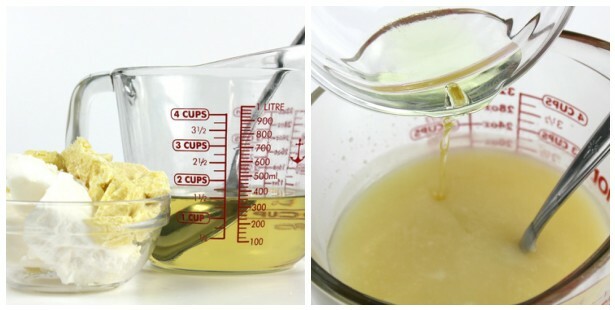 If the mixture starts to thicken up on you, you can pop it in the microwave for 15-20 seconds to soften it back up again. Hint: I estimated my measurements but feel free to weigh out the three small batches for the sake of consistency. FOUR: Once your color is fully mixed in, fill up all of the push tubes 1/3 of the way leaving room for two more colored layers. Tip: To speed up the process of this project, put the push tubs in the fridge while you prepare your other colored lotion layers. FIVE: Pour half of the remaining mixture into another small container and add 1 mini scoop of the Cellini Blue Mica. Mix well. Again, if the mixture starts to thicken up on you, pop it in the microwave for 15-20 seconds. Notice on the left the mixture is thickening. Pop it in the microwave for 15-20 seconds to fully stir in the color. Doesn’t the blue make a beautiful green color when mixed with the yellowish oils? Love it! SIX: Just like the basics of melt and pour soapmaking, we don’t want to pour the second layer too hot and melt the first layer. Make sure the mixture has cooled to at least 125 degrees before pouring the green layer on top of the yellow layer. SEVEN: Repeat steps 4 using the remaining mixture adding 2 scoops of the Red Blue Mica. Mix well, cool to 125 degrees and pour the final layer. Let them cool completely. Hint: I had about 5 ounces of the Lotion Bar mixture left over so I thought it would be fun to make a couple lotion bars in actual molds. You can fill up 2 Oops Molds or 3-4 more Push Tubes with the remaining mixture. It’s all up to your creativity. Have fun making it your own! Other SQ Tips: This recipe differs slightly than the recipe that comes in the Bramble Berry Lotion Bar Kit. It has a softer texture and the obvious addition of the colorants, green tea extract and summer fling fragrance oil. I encourage you to customize this recipe any way that you want. If you want your bar to be a little bit harder try adding 10% more beeswax. Or if you want a less “greasy” feeling, 1 tablespoon of Tapioca Starch will do the trick. Tapioca Starch is velvety smooth and imparts a soft after-feel to the skin. Oh, and remember to go easy on the colorants. We don’t want anyone turning yellow, green or pink after using your lotion bar (grin). Stick with my colorant recommendations and you’ll be safe. Previous Post: Winning Surprises is Fun! I am pretty new to the soaping world, but love this project. i’ve purchased the kit, but was wondering if i could color these with some of my color blocks instead of mica? would this affect the end result? We’d love to be able to use the color blocks for the lotion bars, but they are actually only made for use in M&P soaps as they are actually concentrated blocks of color in glycerin (M&P) soap. 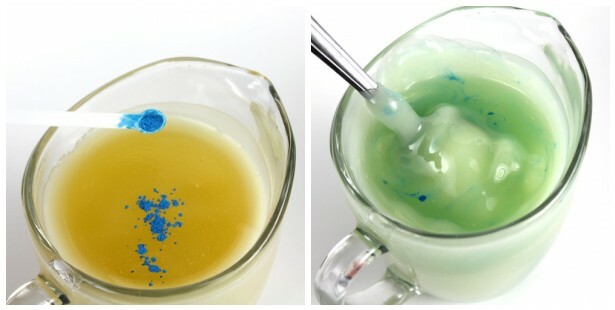 We suggest using mica in the Lotion Bars for that fun color. But just make sure not to add too much, you wouldn’t want the color coming off on the skin. =) I hope this helps! Let me know if you have any other questions. Hi, just a quick question. Would I need to add a preservative to this recipe to be on the safe side? I want to try making lotion bars and wondered if it is possible to add either fresh or powdered goat milk? Would I need to add a preservative? I appreciate any advice you can give. I love your tutorials and Brambleberry products! Can replacing almond oil for grape sees oil really change the consistency of. Recipe? IT can change it a bit, but you can always test out the consistency with the frozen spoon trick. he best way to test the consistency of your lotion bar is to use the frozen spoon trick. You’ll need to put a couple of spoons in the freezer and work on your recipe. When you are ready, you dip your frozen spoons into your liquid mixture and it will harden up immediately on the spoon. Once it hardens on the spoon, you will be able to feel and see the consistency of your lotion bar when it hardens. From there, you can make any adjustments to your recipe as needed. These bars are amazing, many of my friends have commented on how they heal cracks, eczema, etc. Love them.. what other oils can you use instead of jojoba or sweet almond? I saw some sites mentioned using olive, coconut, even apricot kernel oil but I wasn’t sure if the recipe would need tweaking. 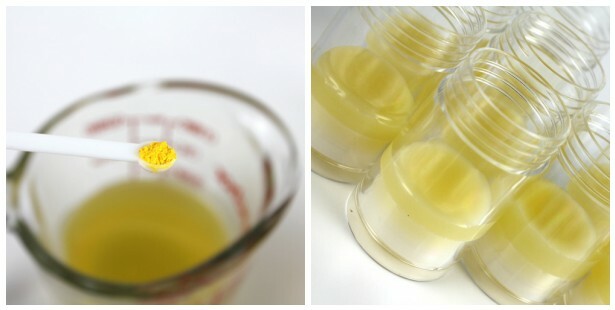 I’ve been using the 1 part oil, 1 part beeswax, and 1 part butter with great results for jojoba or sweet almond.. Thanks Becky, another question! When you say 1 teaspoon or 1 tablespoon, do you mean a heaped or leveled spoon? Also because T starch is so light is it not better to go with weight rather than spoons for consistency? For instance 1 leveled tablespoon is going to weigh significantly less than a heaped spoon. Sorry about all the questions! Love The lotion bars and body balms, Devine! I have a question with regard to the Dry – flo, could you give me an approximate percentage weight to use when making balms, whipped butters etc. For example instead of 1 or 2 tablespoons, would it be 5 or 10% dry -flo out of the 100% total formulation? I ask because it is so much easier when you are weighing out your ingredients using scales using either grams or ounces! We are so happy this worked out so well for you! We always appreciate feedback on our recipes and how they work for our customers. Happy Soaping! There is a bit of a debate over the best way to deal with this. Some people toss the lotion bar into the freezer to have the lotion bar and all its molecules cool down fast, which prevents the grains. Other people temper the cocoa butter by raising the temperature on your melting cocoa butter slowly over a 45 minute period. Then, turn off your heat and cover the cocoa butter and let it cool for about 10 minutes. We’ve found this way to be one of the better ones to achieve a smoother lotion and lip balm look and cut down on the graininess. But, it sounds like you did temper your cocoa butter and that is usually how we do it. How old was the Shea and Cocoa Butter that you were using? As for the temperature, we have not found a perfect range for adding in the Cocoa and Shea butter, but we have found that it tends to melt whenever we add it in. 🙂 That was the recipe I was thinking of! I just don’t know if I want the brownish/tannish color of the bronzer, so I was thinking maybe a gold mica instead. Hello! I had exactly that happen to me with the grainy thing! However, all was fine in the beginning, I live in Florida, so when the lotion was out on the counter and it got warm, it went all grainy. For the life of me, I could not figure it out! I remelted them all, poured again, they set nicely, and then I popped them into the fridge, and they are good. I left a little out on my counter to see what would happen, and it did go grainy again after 2 weeks. The grains feel like shea butter, they rub into the skin, but it doesn’t look very nice! Two things that could be the reason – I used UNrefined Shea butter, and I added 1oz of Grapefruit seed extract,which may be too much – so I thought it could be that, but, not sure! I love them, they look so great, but it would be nice for us to figure it out! I have a few more, and I will make a new batch this weekend doing the very low/slow method, and let you know how it went. Is it possible to make this and leave out the green tea extract? I don’t have any and I want to make some. It’s totally okay to leave the Green Tea Extract out of this recipe. We added because it has such super skin-loving properties and we couldn’t pass up a chance to use it! What over types of butter can you for this recipe? I am tiring to experiment with other butters beside Shea and Cocoa. Love the recipe & the finished lotion bar 🙂 But how in the world do you clean the pyrex cup afterwards? Yikes, I made a mess! Any tips? 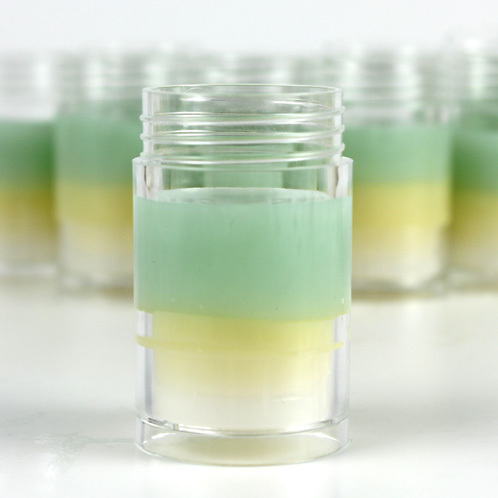 I tried to make this the other day, a few months ago i made it and it turned out great, but this time it wasn’t solid at all, it had the consistency of warm lip gloss/balm. I’m trying to figure out what I did wrong. Not enough beeswax? or heating them too long? Anything clues? And do you think I could remelt them and add something more to them? Sometimes if you are in an area that is a bit warmer, the lotion bars tend to be a little soft. The best way to combat that (or just soft lotion bars in general) is to add a bit more of the Beeswax to your recipe until you find a consistency that works for you.You can defintley remelt the recipe you have already made and add that extra beeswax to it. 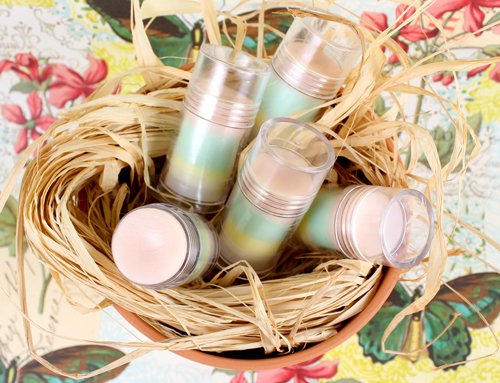 The best way to test the consistency of your lotion bar is to use the frozen spoon trick. You’ll need to put a couple of spoons in the freezer and work on your recipe. When you are ready, you dip your frozen spoons into your liquid mixture and it will harden up immediately on the spoon. Once it hardens on the spoon, you will be able to feel and see the consistency of your lotion bar when it hardens. From there, you can make any adjustments to your recipe as needed. I’ll give this a try. It’s great when we can just remelt and adjust things. Thanks for the advice. Good luck Pat, and I can’t wait to see how it turns out! If you have pictures, we’d love to see them, you can share them with us on our Facebook page. It sounds like your recipe might be a little too hard and is causing your bars to pop right out. You should be able to push gently on the bottom and have it slide right up for you to use. Which recipe are you using? I’d be happy to help you troubleshoot what is going on! The Tapioca Powder is a great product to use if you are make balms, salves or body butters. It helps to cut down on that “greasy” feeling that you can sometimes get from those items. We’ve actually used it in several of our butter/lotion type recipes. Thanks for the great tutorial. I’ve never tried a lotion bar before. What is the difference between this and a salve/balm? I’m so glad you enjoyed the tutorial, it’s one of my new favorite things to do. We actually just made lotion bars about a week ago for a Bite Me Not (Bug-off) bar! The difference between a salve/balm and a lotion bar is the consistency and hardness. Salves and balms tend to be softer and a bit more oily, while lotion bars harden as soon as you pour them and have more of a waxy consistency. I bought these push tubes and ended up really disappointed. One of them, the lotion got around the push base, which I didn’t know at the time. When I went to move the tube elsewhere, the lotion had stuck to the counter and I ended up pulling the entire tube off the actual lotion which then spilled out everywhere. Another tube I filled successfully, but the push plate moves back and forth with no friction. The plate just swings out to and fro willy nilly. Is that how it’s supposed to work? I’m afraid of wasting anymore product in these. That’s really surprising. I’ve never heard that complaint before. How hot were your oils when you poured in the mixture? How you’re describing pushing the tubes does sound normal to me. That’s just how the tube is designed. Can you tell us more about your lotion bar recipe? The lotion bar will be more likely to slide out if it’s a super hard recipe. Keep me posted. We’re here to help! P.S. Did you use the recipe above in your push tubes? I’d love to see pictures of it! I’m glad you were able to get it to that consistency that you were hoping for! Sometimes when you experiment, you come out with interesting and fun results. 🙂 I’m so glad you like the Sweet Meyer Lemon, it is one of my new favorites! Hi Anne Marie I was wondering instead of using beeswax can I use a different wax such as Candelilia wax? If so would I use the same amount as suggest for the beeswax? Thanks so much. If you use Candellila, it will be much harder. That wax is considerably more hard than beeswax. If you’re going to experiment with Candellila, just do small batches =) It’s about 15-20% harder in my experience and it is much more brittle. Thank you Becky I did do a test run. First batch I used a third less then what it asked for bees wax turned out to soft and liquidified immediately when touched. Second batch I used half of what it asked and it worked so far I will see how it turns out tomorrow when I play with it. It sounds like your second batch is getting to the correct consistency and not too hard or too soft. If you have pictures, you should share them on our Facebook page, we’d love to see how it turned out! Lol. But I will post pics because I got it to the consistency that I like it which is firm until touched then it is smooth not brittle. I appreciate your help. Now time for me to learn how to make shea butter frosting instead of using meringue powder. Oh and I forgot to say I used that sweet Myers lemon in the third batch my mouth waters every time I smell my hands. Love it so fresh and citrus smelling. Hi! Instead of the Green Tea extract, you can use any other oil soluble extract!! I made these lotion bars and found they are a little soft for what I wanted, and I used .5 oz less almond oil and .5 more cocoa butter when I made the recipe. If I want to melt down and re-do the batch, what could I add to make them harder? More beeswax will do it for you! We suggest starting with 1 oz. for the recipe you are using and moving up from there. A great way to test the formulation of your recipe is the spoon trick! What you do is put a couple of spoons in the freezer. When you are ready, you dip the frozen spoons into the liquid mixture and it will harden up immediately on the spoon. That way you will be able to see what the consistency is before it fully hardens. Then you can make any adjustments you need. If you have any questions or want a more detailed description, a great video is the Lip Balm Online Tutorial! Thank you so much Becky! I was making a half-batch of this recipe, but I went ahead and used a full oz of additional beeswax when I melted everything down,used the spoon trick to test it, and it turned out perfectly! Nice and hard but melts smoothly when applied to skin! Yay! It is soft enough for the tubes and hard enough that it popped right out of my heavy duty dragonfly mold with a perfect dragonfly! I had a customer request these in yellow and scented with BB’s Yankee Candle type Lemon Verbena and I think she will be very happy with them! You are so welcome Elizabeth! I am so glad that trick was able to help you out! Yay, for fantastic Lemon Verbena Lip Balm! If you have any pictures, you should share on our Facebook page! Which extracts that BB carries are oil soluable? All of the INCIs for the extracts contain the ingredients. If it’s in Capric Triglycerides, that’s oil soluble. That’s the name for Fractionated Coconut Oil. 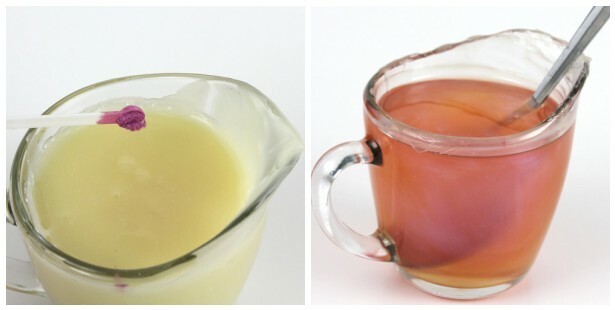 Other ones are in aloe vera juice (water soluble) and liquid glycerin (semi soluble in oil). So just look at the ingredients listing. I just ordered this and I always have to tweek stuff.Can I add some of the glitter I use for my MP soap? It is from Bramble Berry so I know its body safe. And how do I know which fragrance oils and colors are ok for lotion? Thanks again Love BB!!! Also thank you for the nice comments on my facebook soap pics.HUGS!! Yes, you can tweek it and use glitter (but it’s awfully scratchy in lotion bars and is hard to suspend). Any oils from Bramble Berry, as long as they are not specifically stated that they are only for candles, are body safe for lotions and soaps. This lotion bar has been a blessing for my daughter. She has some stubborn psoriasis and this is wiping it out! You’ll love the Lotion Bar Kit. If we’re out of anything, we’ll contact you but I thin you’re probably good because we usually save a bit back for kits. =) Fingers crossed. Thank you for your business. I am trying to make solid lotion bars for the first time and am having a fragrance issue. I used a recipe that is 1 part beeswax (used yellow), 1 part solid (used unscented cocoa butter) and 1 part oil (split this up to use coconut oil, olive oil, and almond oil). The texture and how it feels on the hands is perfect. The problem is the fragrance. I used 2 different scents (coconut and mango), after a combined 180 drops of fragrance, my finished product only smells like the beeswax and I cannot smell the scent at all. I bought a solid lotion bar, that boasts beeswax as it’s main ingredient, but I cannot smell the beeswax at all and only smell the fragrance. I have read that if you are using beeswax then there is no way to get away from that smell. You definitely can overscent over beeswax – it’s just a matter of how much scent you use. You didn’t mention how big your batch was so I’m not sure if 180 drops was enough or not but if you’re not smelling the fragrance, I’m guessing it wasn’t quite enough. Good news, you can remelt the lotion bars down and add more fragrance. Just slowly melt down, taking care to stir every few minutes because glass can get extremely hot when melting waxy lotion bars from zero. =) Usage rate for fragrances in lotion bars is around .5% to 2% by weight. I just made these and I think they’re great for keeping your skin soft, but they ended up having a hole at the top (poured too hot?) and they’re too soft for my liking. It’s definitely not a bar and more like a gel. Hole at the top …. you could remelt some leftovers to fill them. But yes, it could be poured too hot. Mine weren’t like a gel. They were definitely solid but that said this is a pretty soft recipe. If you are wanting for a more solid recipe I would add more cocoa butter and less Sweet Almond oil. You can use the trick I learned a long time ago when formulating new lip balm to test the consistency. Put some spoons in the freezer before you start making your product and dip one into your still melted recipe. It will set-up immediately and you can test it to see if it is the hardness you are looking for. Then you can make adjustments to your recipe (remember to take notes!) before pouring the full bar. Hi love this recipe and have been wanting to make these for so long now. But i have 2 questions for you and i hope you can help… I have already bought Coconut butter to melt and infuse with herbs of choice so instead of using sweet almond oil i was going to use that, so is it ok to use the coconut infuse herb oil instead of the sweet almond? and 2nd Q is it ok for me to mix the Cocoa butter and Coconut butter together? I dont want to make it to thick. I could always just make it and find out but i hate to waste what i have already bought and would hate to buy the cocoa butter if it wouldn’t work anyways! P.S.- Great site and Youtube videos!! 🙂 you guys should make a video about hard lotion bars! Sorry i must correct myself i dont have coconut butter i have coconut oil! So maybe there wont be a problem then….. But i did think of one more question (sorry) hehe ok the cocoa butter is this something i can buy anywhere like its the stuff you see on drug store selves or should i be looking for a certain type of cocoa butter?? Sorry for all the questions i just want to get this right! Coconut Oil is considered a “hard” oil. It’ smelting point is 76 degrees so it’s usually hard at room temperature. It’s okay to infuse the herbs into the coconut oil but it can’t be replaced with the sweet almond oil in this recipe. Sweet almond oil is a “soft” oil that stays liquid all the time. I’m not sure what you’re asking regarding the cocoa butter and coconut oil. But you can definitely mix them together and infuse them with herbs or use them in a recipe. The cocoa butter that we sell is in its raw and natural form. It’s actually a hard chunk and not creamy at all. The cocoa butter that you see on the drugstore shelves is usually a lotion or cream. That is not what you want to use in a recipe like this. I made this recipe without any color or fragrance oil–I just mixed up the almond oil, beeswax, cocoa and shea butters as directed and poured into plastic containers to use for a skin lotion. It set up nicely, but later I noticed it had “beads” in the lotion and was not a uniform consistency. I had heated everything together until all the butters and beeswax were melted. What did I do wrong? Can I re-do this lotion? Did you remember to stir in the shea and cocoa butter? If they get too hot they can get a little grainy, which is just the nature of the butters. The only other thing I can think of is if it wasn’t mixed all the way. If that’s the case, slowly remelt the mixture (low temps) and give it a good mix then pour back into the containers. Yes, that was probably the problem. I melted everything together and they probably got too hot melting with the beeswax. Next time I will stir the shea butter etc in separately! My bar went grainy..can it still be used? The grainy feeling is probably because the shea butter got a little too hot. That’s just the nature of shea butter. Despite the grains, it’s 100% safe to use! Love the recipe! I ordered the push-up tubes. They are wonderful except for the fact that the entire cylinder of lotion (with the push up part attached) falls out when the tube is turned upside down! Is this the standard way this tube operates, or did I happen to get a defective batch of tubes? I made this recipe and it turned out beautifully, especially given it was my first time making lotion bars. I was wondering if you would advise shipping the bars. I live in TX, so it’s getting hot here. I’d hate for them to melt en route. I’m so glad you like the recipe! Shipping recipes that can melt in the summer is a very tough situation and there are many variables that are out of your control. Could you use soy wax in place of Beeswax ? I LOVE this idea! Can you do it without the push up tube? Yes, Anne-Marie also poured a few into little guest soap molds to use as lotion bars. They work wonderfully! I had made a different lotion bar recipe (not from your site 🙂 that turned out almost like a petroleum jelly consistency. It went on great but left feet sticky and able to attract small fibers from beyond. Is this a thicker, more flip-flop friendly recipe? This is a pretty soft recipe, so probably not what you are looking for. If you are wanting for a more solid recipe I would add more cocoa butter and less Sweet Almond oil. You can use the trick Anne-Marie taught me when formulating new lip balm to test the consistency. Put some spoons in the freezer before you start making your product and dip one into your still melted recipe. It will set-up immediately and you can test it to see if it is the hardness you are looking for. Then you can make adjustments to your recipe (remember to take notes!) before pouring the full bar. all this fuzz over colors and cuteness and details but what really matters is left to the sidelines. how about dedicating some time and effort to non-petrochemical based additives. most of the perfume oils that you carry have pthalates and other chemicals that are either toxic or have never been studied for toxicity. if you don’t make or sell pthalate-free products what about featuring a vendor who does? making a perfumey soap is not a big deal. making a sweet smelling soap that doesn’t contain dangerous chemicals is! Thanks for bringing up your concerns. I love that my readers feel comfortable enough to ask these kinds of tough questions. Many of the fragrances at Bramble Berry are phthalate free – including Summer Fling. So this recipe is a phthalate free recipe. We are working on adding a comprehenive list of all of the phthalate free fragrances to our website, but in the mean time you can get an up-to-date list by emailing customer service at info(at)BrambleBerry(dot)com. The petrochemical question is definitely trickier. You could just replace the fragrance oil with an essential oil (I think Tangerine would be lovely!) and have a petro-chemical free recipe. But then you have the packaging to consider – and of course all plastics contain them. In fact, as I look around my desk from the keyboard I’m using to my pen to my water cup to the soles of my cute shoes it seems everythig contains petro chemicals. But I totally agree, everything we can do to reduce our reliance on fossil fuels is a victory for the environment and declares that personal choice can and does make a difference. Please let me know if you have any other thoughts and in the meantime, here’s a link to our Essential Oils page and our Herbs Page so you can work on being as natural as possible with your soaps and cosmetics. I LOVE how you handle these types of tough questions! You are a composed and seasoned business women who has no issues sharing what is really in the products. That is why I love BB! Thanks Anne Marie! Love this post. Thanks. The colours are so pretty. Anne-Marie, we want to wish you all the best for the upcoming new addition to your family. You should be very near now. Seems like it could double as a lip balm recipe?? oooh sooo coool, I have to do this! Thanks for sharing this great project. Thank you! I hope you do give it a try. The recipe is super easy (but you don’t have to tell anyone that)! Thanks, Claudia. I have one on my desk right now. They’re just too cute! Pretty! It looks like some of the lotion gets stuck to the sides of the tube…is it hard to push out? Not at all. It actually slides out easily. As it cools, some of the lotion bar slightly pulls away from the sides. The push tubes are so prefect for lotion bars. Thank you. The layers really spice up the traditional lotion bar!